Manufacture borescope cabinet to drawing number 09-02-6311. Following site visits and telephone conversations this design has been produced based on the exact requirements and specification of the team that will use the equipment. The cabinet will be used to transport and securely store the expensive borescope equipment, which is used to prevent unnecessary engine maintenance. The framework will be manufactured from 40mm x 3mm SHS and 1.2mm sheet metal infill panels. The cabinet will feature 3 off shelves with the following internal dimensions: 937.6mm wide x 460mm deep. The shelves have a 331mm extension, and can be locked in place when not extended. A 4th static shelf will also be fitted once the monitor has been positioned and its location agreed. 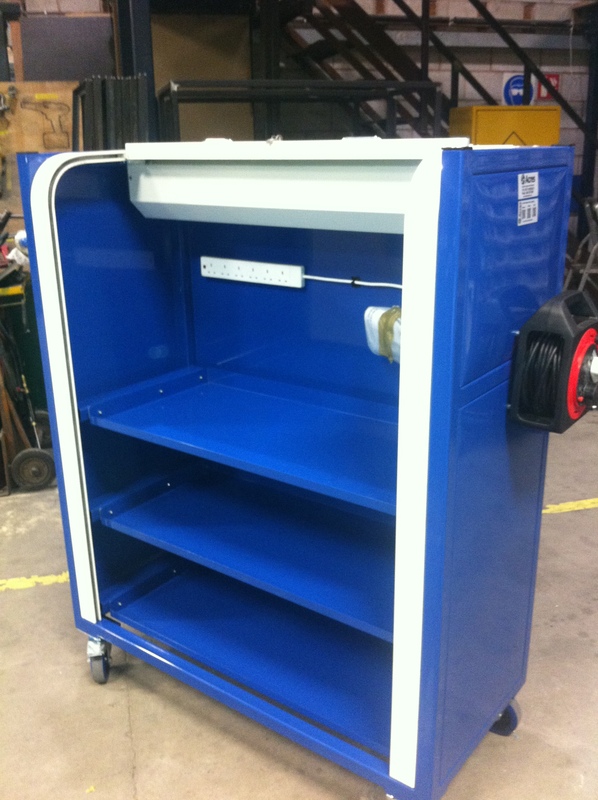 The cabinet will be fitted with 4 off 125mm diameter swivel with brake blue rubber castors. These are smooth, quiet and hardwearing. Within the cabinet, there will be an adjustable arm for a TFT monitor ( size to be advised by customer)and a 6 way power block so that all of the equipment within the cabinet can be plugged in. The power block will be connected to a 25m extension lead attached the outside of the trolley. The trolley will be delivered with a converter cable to make it more universal to its surrounding environment. The cabinet has been designed to house all of the equipment needed to carry out the inspection procedure, because of this it should increase productivity. The trolley has also been designed with the handles at the preferred height of the operators, making it more ergonomically acceptable.